Inside the Tax Bill’s $25 Billion Oil Company Bonanza. President Donald Trump pitches the Tax Cuts and Jobs Act at the Andeavor oil refinery in North Dakota on September 6th, 2017. Pacific Standard‘s original analysis finds that it is the oil and gas industry, including companies that backed the presidency of Trump and whose former executives and current boosters now populate it, that are among the tax bill’s largest and most long-lasting financial beneficiaries. Just 17 American oil and gas companies reported a combined total of $25 billion in direct one-time benefits from the 2017 Tax Cuts and Jobs Act. Many of the companies will also receive millions of dollars in income tax refunds this year. Looking forward, the Tax Act then reduces all corporate annual tax bills by a minimum of 40 percent every year in perpetuity, while adding new benefits that function as government subsidies for the oil and gas industry. The companies’ activities in the United States are made less expensive, thereby encouraging a further expansion of oil and gas operations. Pacific Standard reviewed the Annual 10K and Fourth Quarter Reports filed with the U.S. Securities and Exchange Commission for 2017 by 17 U.S. oil companies, looking at the largest companies in production, refining, and pipelines that also clearly specified the impacts of the Tax Act in their results. Private companies, such as Koch Industries, which undoubtedly benefit from the legislation, could not be included because they are not required to make these financial reports publicly available. Energy giant ExxonMobil reported $5.9 billion in immediate tax savings as a result of the Tax Cuts and Jobs Act, yielding not only the highest oil industry payout, but also ranking it second only to Apple as the nation’s single largest corporate beneficiary of the GOP tax bill. Secretary of State Rex Tillerson is the former chief executive officer of ExxonMobil (deferring investments in Exxon during, and for 10 years after, his public service, which ends on March 31st) and past chairman of the American Petroleum Institute, which lobbied aggressively for the Tax Act. Chevron and ConocoPhillips, the second- and third-largest U.S. oil companies after ExxonMobil, received $2.02 billion and $852 million in tax savings, respectively. Energy Transfer Partners, the company behind the Dakota Access, Bayou Bridge, and Rover oil pipelines, a large financial backer of candidate Trump, and on whose board Energy Secretary Rick Perry previously served, reports receiving $1.53 billion. Like many other oil pipeline companies, Energy Transfer Partners is organized as a Master Limited Partnership; a corporate structure specially rewarded in the Tax Act with an extra tax rate reduction. 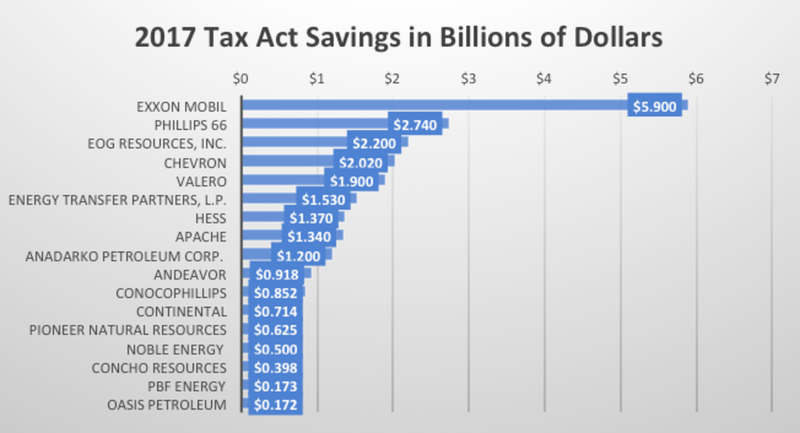 The nation’s leading refiners came out big, with the second-highest overall Tax Act savings behind ExxonMobil going to Phillips 66 with $2.74 billion, and Valero rounding out the top five oil company beneficiaries, with just under $2 billion. All totaled though, it may be the nation’s domestic oil and natural gas frackers who received the biggest combined immediate rewards from the Tax Act. EOG Resources, for example, garnered the third-highest oil sector pay-back with $2.2 billion in tax savings, followed by Hess at $1.37 billion, Apache at $1.34 billion, Anadarko at $1.2 billion, Andeavor (whose North Dakota oil refinery served as backdrop to Trump’s speech pitching passage of the Tax Act last September) at just under $1 billion, and Continental Resources at $714 million. Continental’s Harold Hamm, a staple figure at Trump’s side at addresses before oil industry audiences (including when Trump pitched the Tax Act), is regularly credited as a guiding force behind Trump’s domestic energy policy. Foreign-based Shell and BP each reported initial losses as a result of the Tax Act at $2 billion and $1.5 billion respectively, stemming from changes in the rules governing the use of past losses to offset future profits. Each company, however, was quick to point out in public statements that it expects the future impacts of the legislation to be positive due to the slashing of the corporate tax rate. The Institute on Taxation and Economic Policy, a non-partisan think tank that analyzes tax policy issues, delved even deeper into the 10K’s of 11 of these oil companies for Pacific Standard. ITEP found that, in addition to the one-time tax savings, five of the 11 companies will actually receive federal income tax refunds this year. American taxpayers will send California’s Chevron a check for $382 million, as well as checks to Apache for $38 million, Marathon Oil for $32 million, Hess for $23 million, and Pioneer for $5 million. The Tax Act has many benefits for corporations, most notably a permanent slashing of the corporate tax rate from 35 percent to 21 percent, or a 40 percent cut in company tax bills. These immediate $25 billion in oil company benefits are primarily the result of companies that had deferred payment of taxes they owe to some point in the future. The more billions of dollars they deferred, the more savings they got from the Tax Act. This is because money that they would previously have been required to pay a tax rate of 35 percent on is now taxed at just 21 percent. But that is only the beginning. 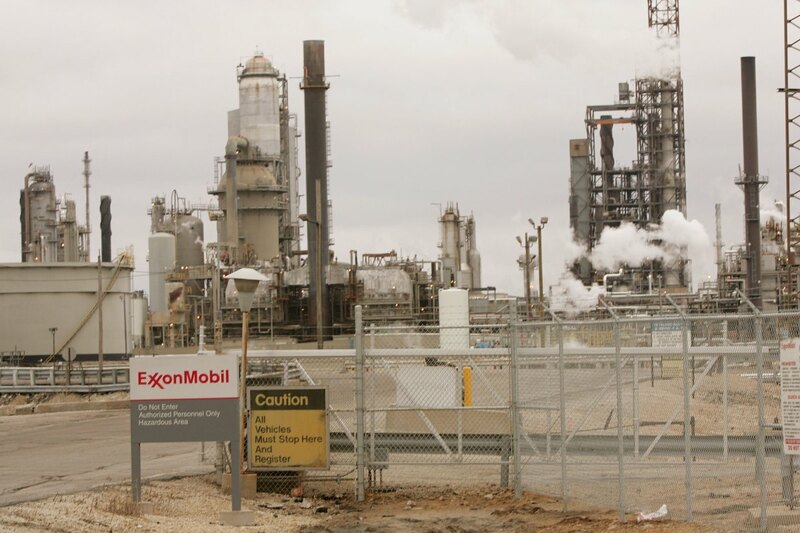 The ExxonMobil refinery in Joliet, Illinois. As a result of the Tax Act, ExxonMobil’s effective tax rate on its U.S. federal income fell from just 3.7 percent in 2016 to a negative -85.6 percent in 2017, according to the IETP analysis. Fellow negative-tax-rate beneficiaries include Anadarko at -17.2 percent, Pioneer at -1.6 percent, and ConocoPhillips at -1.5 percent. In 2017, only Chevron and Valero paid more than a 6 percent effective federal income tax rate of the 11 companies studied. One reason is that, while often dramatically lower than their statutory tax rates, on average, the oil industry’s income taxes run higher than the overall S&P500, and thus the 40 percent reduction disproportionately helps them. In addition, with their often-substantial foreign operations, the Tax Act’s reduction on how some foreign holdings “repatriated” to the U.S. are taxed adds another benefit. But before you get too excited at the idea of billions of corporate dollars potentially pouring back into the U.S. from abroad, Dean Baker of the Center for Economic Policy Research explains that companies could simply make a paper switch amounting to little more than shifting money in one account at Citigroup under a foreign subsidiary’s name to another account under the name of the U.S.-based parent company, “which means essentially nothing to the U.S. economy,” but could mean billions in tax savings to the company. In addition to keeping virtually all of the oil industry’s substantial existing tax breaks, the Tax Act provides a new subsidy for how the companies deduct the costs of capital expenditures such as drilling equipment, lowering their tax burden while encouraging more capital spending, with the likely result of increased production and other operations. And finally, the bill also opened part of Alaska’s Arctic National Wildlife Refuge to oil and gas development.